Shoe Carnival, Inc. (NASDAQ:SCVL) stock was flying high on Thursday following positive results in its earnings report for the second quarter of 2017. Shoe Carnival, Inc. reported earnings per share of 24 cents in the second quarter of 2017. This is an increase over its earnings per share of 22 cents from the second quarter of 2016. It was also a boon to SCVL stock by beating out Wall Street’s earnings per share estimate of 20 cents for the quarter. Revenue reported by Shoe Carnival, Inc. in the second quarter of 2017 was $235.06 million. This is up from its revenue of $231.91 million reported during the same time last year. Analysts were looking for the shoe company to report revenue of $232.3 million for the second quarter of 2017. Operating income reported by Shoe Carnival, Inc. for the second quarter of the year was $6.42 million. This is down from its operating income of $6.66 million that was reported in the same period of the year prior. During the second quarter of 2017, Shoe Carnival, Inc. reported net income of $3.90 million. The shore retailer reported a net income of $4.10 million in its second quarter of the previous year. 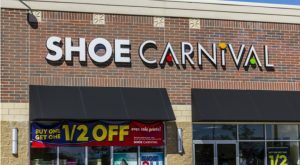 Shoe Carnival, Inc. notes that it plans to open between 25 and 27 new stores in 2017. It will also be closing down 19 stores during the year. The company opened 19 stores and closed nine locations in 2016. Shoe Carnival, Inc. says that it is expecting earnings per share to range from $1.35 to $1.45 with revenue coming between $1.006 billion and $1.019 billion in 2017. Wall Street’s estimates have the company reporting earnings per share of $1.39 on revenue of $1.01 billion for the year. SCVL stock was up 20% as of noon Thursday, but is down 25% year-to-date. Article printed from InvestorPlace Media, https://investorplace.com/2017/08/shoe-carnival-inc-scvl-stock/.